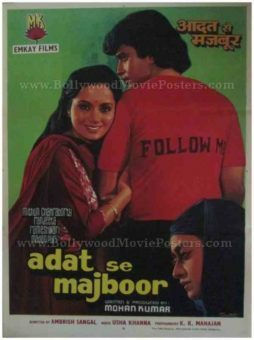 Old Bollywood film poster for sale of the classic Hindi movie Aadat Se Majboor (1982). This is an actual surviving old Bollywood poster for sale of the 1982 Hindi film that starred Mithun Chakraborty and Ranjeeta in lead roles. Printed and circulated during the original first release of the film (somewhere in the early 1980s), this Mithun Chakraborty movie poster was designed for publicity of the film but never ended up being used. This Mithun movie poster was originally designed by over painting still photographs by one of the greatest Bollywood movie poster artists of his time, V.G. Parchure of Pamart Studio fame. The printed signature of Bollywood poster painter V.G. Parchure in the name of his art studio Pamart is seen on the bottom right hand corner of this Mithun film poster. This old Bollywood poster bears the signature traits of V.G. Parchure artistic style. Mithun Chakraborty and Ranjeeta are seen prominently in this old Bollywood poster. This old Bollywood poster for sale is set against a minimal green background, with the typography appearing in yellow.